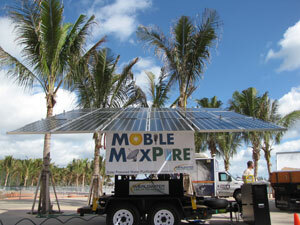 Mobile Max Pure Water filtration system. CHICAGO (FinalCall.com) - Cholera, a deadly but preventable disease, has killed some 2,500 people in Haiti and another 150,000 are estimated to have been infected with the disease. The water-borne malady causes dehydration, diarrhea and too often death in a country still struggling to progress a year after one of the worst, if not the worst, natural disasters to hit an urban area. Port-au-Prince, Haiti's capital, was devastated by an earthquake that killed hundreds of thousands and has left over one million people homeless. While there has been talk of inoculation to keep people from getting sick there is another way to help relieve suffering and save lives: Provide Haitians with good, clean water. The Honorable Minister Louis Farrakhan and the Nation of Islam have embarked on an effort to help save lives and deliver pure water to Haiti's masses through purchase of the $120,000 Mobile Max Pure solar generator that purifies water. In other words, the sun powers a unit that cleans dirty water and can also be used to charge cell phones, run computers and electrical tools or provide a place to plug in lights. The Nation of Islam's purchase of the unit is part of efforts to support relief and rebuilding efforts in the Caribbean nation. But, officials said, the hope is that other organizations, churches, groups, and wealthy individuals will do the same thing—invest in a device that can help save Haitian lives right now. And, beyond the cholera epidemic, clean water is one of the country's most pressing needs. According to Melissa Burns, vice president of World Water and Solar Technologies, based in Princeton, N.J., the company has about 60 units operating around the world. Five systems are on the ground in Haiti and the Nation of Islam will be providing the sixth system inside the country, she said. The device is self-contained and essentially a utility-in-a-box, Ms. Burns explained. The Mobile Max Pure is a seven-foot-cube, takes about 20 minutes to set up, unfolds like a flower and pulls water from any source, she continued. Before the Mobile Max Pure is deployed, discussions are had between the manufacturers and party purchasing the system, said Ms. Burns. The unit and accessories are then assembled to meet the needs of the location where the unit will be used, she continued. It can even turn salt water into fresh water, Ms. Burns added. The purificiation process also does not use any chemicals, she said. “This calculation includes capital costs and all consumables over the course of the first year. After year 1 the cost reduces to fractions of a penny per gallon because the capital outlay has been paid off,” the company said. An optional satellite communication system and a specially designed trailer to easily pull the unit to sites is available, said company. “The Mobile Max Pure fits easily into standard international shipping containers; and fit into a standard 40-foot container. There are lift points built on to the sturdy frame to airlift the unit by helicopter. 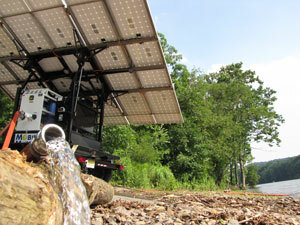 It can also be transported by truck or boat,” according to World Water and Solar Technologies. No delivery date for the unit has been set by the Nation of Islam but officials said it is expected to be delivered after unrest that has followed a recent disputed presidential and parliamentary election has settled. UPDATE: Thanks to all involved to make the project a success, the first clean water unit has been been installed. To help with this effort, donations may be sent to Disaster Relief Fund, 4855 S. Woodlawn Avenue, Chicago, Ill. 60615.